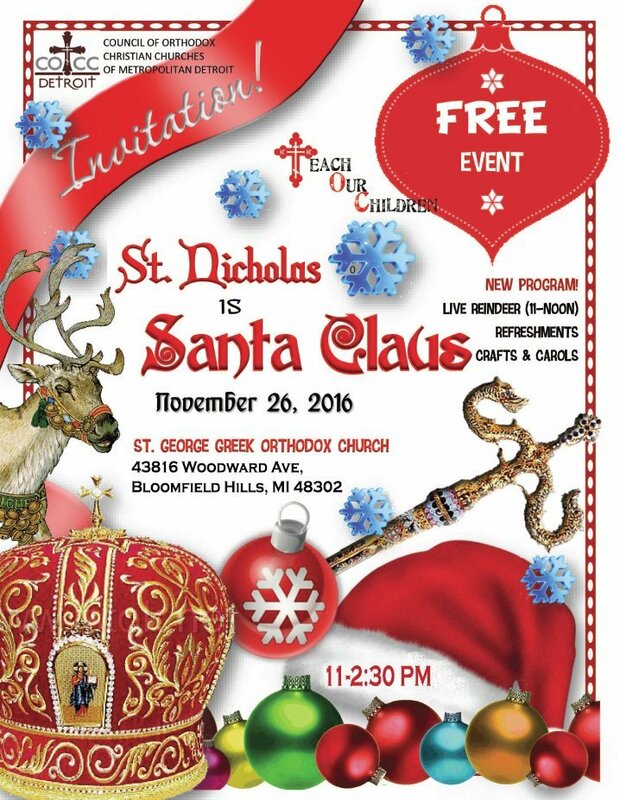 DETROIT, MI [COCC] -- The Council of Orthodox Christian Churches of Metropolitan Detroit (COCC) will sponsor its fifth annual "St. Nicholas Is Santa Claus," a Nativity-season children's party, on Saturday, Nov. 26 from 11 a.m. to 2:30 p.m. at St. George Greek Orthodox Church, 43816 Woodward Ave., Bloomfield Hills. "The party will feature the story of St. Nicholas as told by St. Nicholas himself," said Richard Shebib, chairman of the event. "Children will meet St. Nicholas and receive a gift while their parents take their pictures. They will do a craft project, and there will be a carol sing-a-long and refreshments." From 11 a.m. to noon, children will also be able to have their pictures taken with live reindeer. The party is free of charge and open to Orthodox and non-Orthodox children of all ages and their parents. Refreshments will be served. For further information, contact Shebib at (248) 345-9346 or paschabooks@sbcglobal.net.